1.Cats have scratchy toungs. 2.Cats can see in the dark there eyes glow too. 3.Cats rarely meow at other cats. 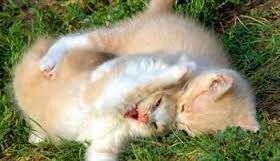 4.Cats spend 30% of their aking hours grooming themselves. 5.When cats are happy, they may squeeze their eyes shut.